I love almost anything in the form of potatoes, and was delighted when I came across fingerling potatoes at The Fresh Market. I had never seen nor heard of fingerling potatoes (they remind me of baby potatoes), but I was eager to try them out since I love potatoes, after all. I didn’t have trouble of thinking of a recipe, because I immediately knew what I wanted to try it out with: cherry tomatoes, another favorite of mine! Therefore, I bought a pint of organic cherry tomatoes and a container of fresh mozzarella from the olive bar at The Fresh Market. Since I already had some of my favorite herbs (basil and oregano) in my pantry, there was no need to get anything else! 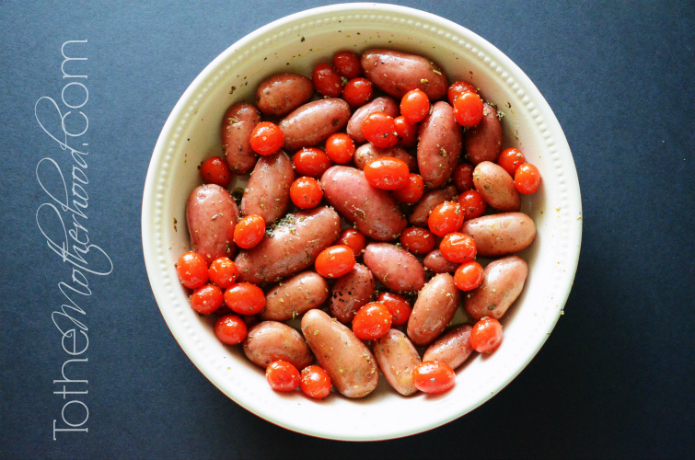 Place the fingerling potatoes in a dish (I used a pie dish) and drizzle them with olive oil. 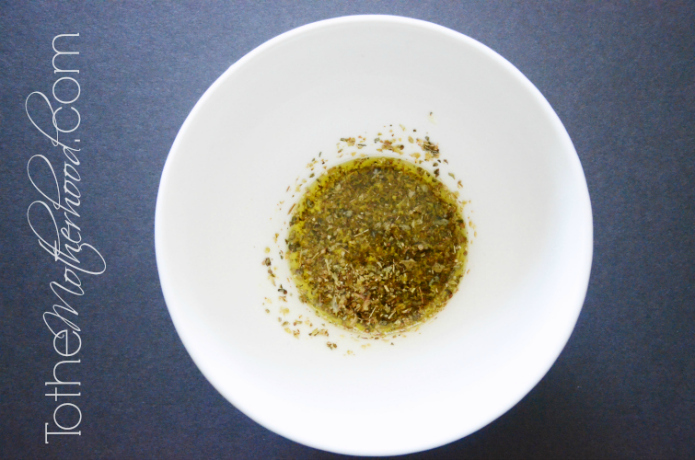 Add olive oil, 1/2 teaspoon of basil, and 1/2 teaspoon of oregano in a medium sized bowl. 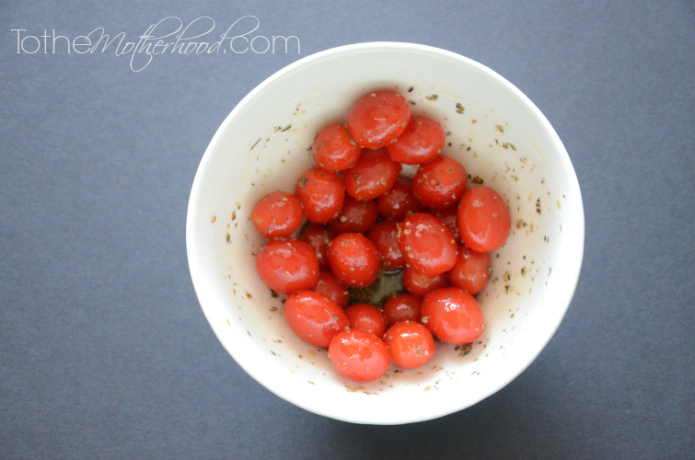 Place a handful of cherry tomatoes in the bowl and stir the ingredients together until the cherry tomatoes are fully covered in olive oil, basil, and oregano mixture. Repeat the same steps if you prefer more cherry tomatoes in your recipe. Then, carefully place all of the tomatoes on top of the potatoes. Place dish in oven and roast for 35-40 minutes, or until the vegetables are tender. Wait 15-20 minutes for them to cool before adding fresh mozzarella (or beforehand if you prefer your roasted vegetables to be cheesy). Oh num they looks so good, I rarely use that type of potato. April Decheine recently posted..Comment on Dandelion Cranberry Tea – Jillian Michaels Inspired by Marcie W.
Delicious! 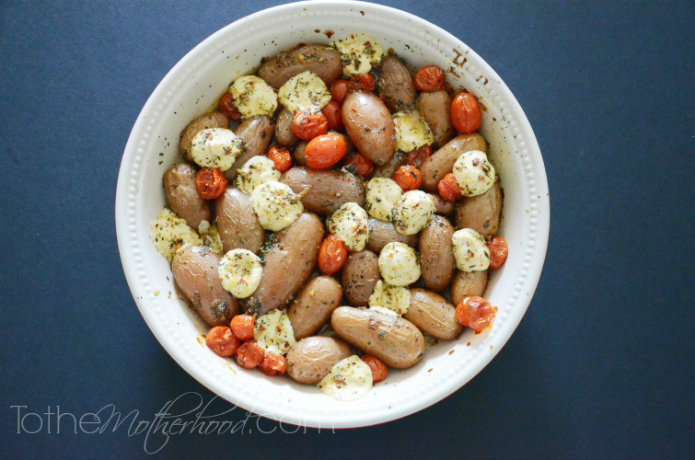 I love potatoes, and I love cherry tomatoes and mozzarella, so how could I go wrong here? Those Potatoes are my favorite! This looks amazing. I may try this tonight! Tomatoes and fresh mozz are one of the BEST combos and to add potatoes too? Yum! That sounds sooooo good. Totally right up my alley! Yum!! I can’t wait to try this recipe. Love mozzarella cheese in anything! This looks incredible! Simple but tasty, I could totally eat just this for a meal (not the whole thing lol). Yummy. I love fresh mozz! And incredibly easy to make. the dish looks fabulous and with the mozzarella!! super super yummmmm!!! I’ve never used that kind of potato before, either, but it looks really good. Especially paired with the tomatoes and mozzarella, yes please. 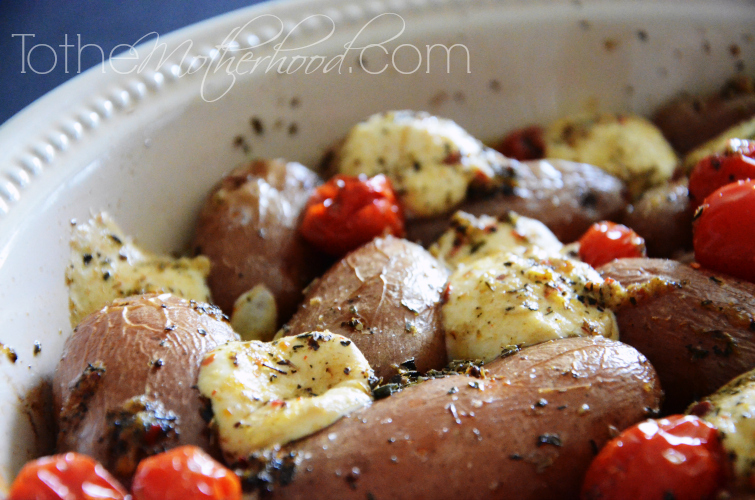 I’ve never prepared fingerling potatoes but this looks so amazing! Kelly @ Texas Type A Mom recently posted..Little Animal Lover Bunny Love! It’s so interesting that you just posted this because my friends and I went out for lunch the other day at an Italian Cafe and one of them ordered almost this exact dish…except on a bed of lettuce to make it a salad! She was worried about the fingerlings in the salad, but said it was really good. Tammy Litke (@threedifferent) recently posted..PEANUTS | Teaser Trailer Debut! That looks AMAZING! Potatoes are one of my weaknesses! YUM! I am pinning this! I love roasted veggies, especially potatoes! This looks delish! I’m not sure if I’ve had those potatoes before, but the entire dish looks AMAZING! I definitely want some. This would make for a perfect side dish with roast. It looks so delicious and easy to make. Thanks for sharing. Oh I love the herbs, potatoes, and cheese. Sounds like a great side dish. This looks so good. I have been looking for new ways to serve up potatoes. You put the dish directly into the oven? Great idea for making sure everything cooks evenly and is warm when being served. 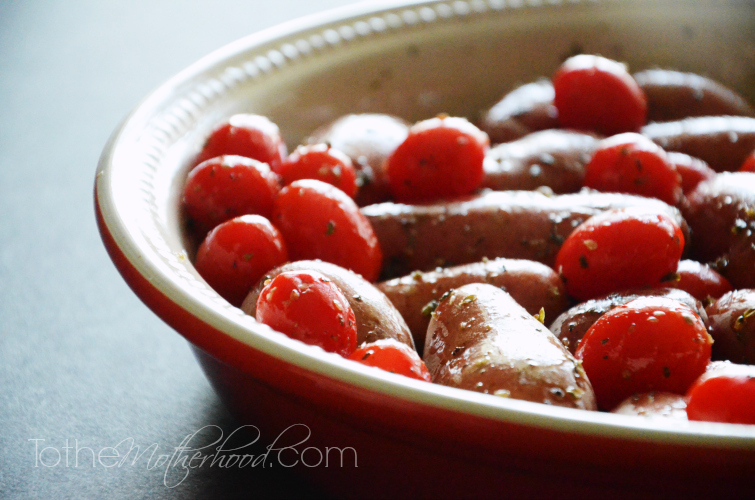 I’ve never cooked with fingerling potatoes but I like the effect it has in this! I’ve never seen potatoes like that before…. Yum, this looks good. I love roasted tomatoes and potatoes, just never thought to add cheese. 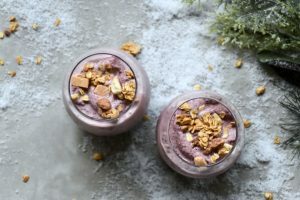 Such a simple but yummy recipe!! I’m going to give this a try! I won’t eat the tomatoes out of it but 3 of my family members will! This is something we would for sure eat in our home. I personally don’t like tomatoes but my husband loves them. So I would use them then just pick them out for my portion! What a fantastic side dish and it contains two of my favorite foods: potatoes AND cheese! That looks fabulous!! I love fresh mozzarella! Every component of that dish sounds absolutely fantastic! I’ve never tried fingerling potatoes but I have no doubt I’d love them. 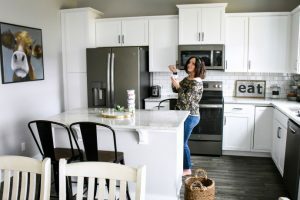 Liz Mays recently posted..Get Ready for the #FamilyDollarMore4Less Recipe Challenge! This sounds so amazing. I never would have thought to combine these items, and yet it looks and sounds perfect. I know that my kids would really enjoy it, too. I am going to pin it so that we can make it with the first batch of cherry tomatoes from our garden this year. I love all these ingredients, especially fingerling potatoes. Would have never combined them but now I have a new side dish to make!